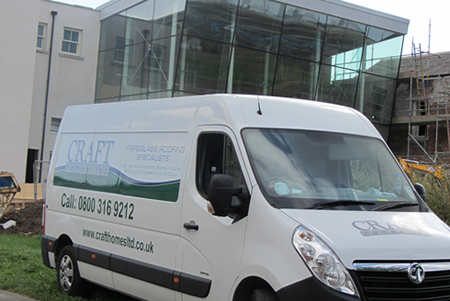 Craft Homes Ltd can give you expert advice, whether you are an architect looking to specify a roofing product for a project, or a builder wanting to cure a problematic roof. We have extensive knowledge and experience in the application of GRP (Glass Reinforced Polyester) roofing on large roofing projects, in addition to domestic-sized roofs. We can survey the roof or take measurements and details from a set of plans. We can provide you with a detailed quotation, a specification if required and a program of works. We can also provide advice in upgrading insulation to bring a building in line with the current building regulations and the u-values required. We will provide method statements and health and safety documents where applicable. 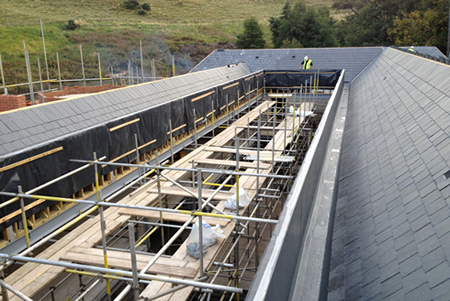 A GRP waterproofing membrane is a totally monolithic covering. It is a lightweight alternative to other more traditional materials. It is a liquid cold-applied product and does not require the use of heat and flame, so is ideal for use on school and hospital buildings or areas with fuel storage or other fire hazards. The versatility of the product means that a large expanse of roof can be installed in one seamless piece. We can include all necessary expansion facilities that may be needed and even form gullies and channels to aid the flow of rainwater off the roof. Complex shapes and configurations of roofs are easily installed in one piece. The system can be installed on to either a specific type of decking board, asphalt or even directly applied to concrete. A GRP membrane in not restricted to use on flat roofs. There are many applications where GRP will outperform other traditional materials and methods. For instance, GRP is ideally suited to install in a balcony application and it can even be installed with an attractive non-slip finish using natural slate chippings. On areas where heavy foot traffic is likely to occur, we would specify a heavy-duty laminate. GRP can be installed anywhere where lead and copper would normally be specified. Whether you are replacing old and fatigued lead, specifying new lead on a particular project or worse, where the lead has been stolen. GRP is the obvious choice. GRP can be coloured to look like lead. It can even have simulated rolls incorporated. There is no need for steps and welds on long gutters and GRP can be installed either flat or with a fall. Craft Homes Ltd © 2018. Website empowered by Simulant.